Map of the District of Columbia. 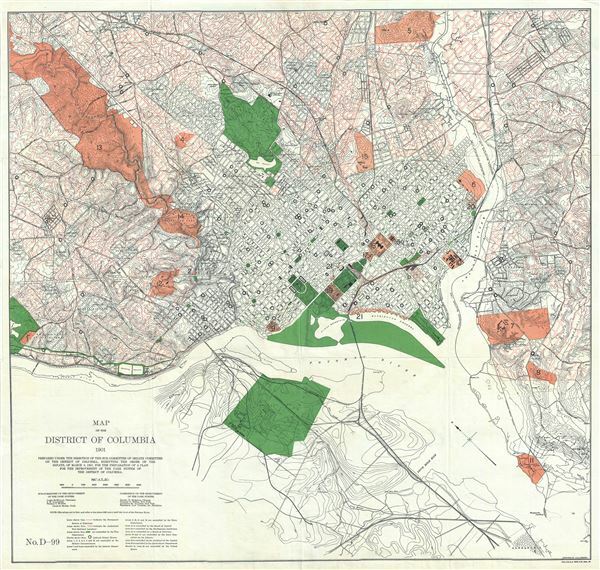 This is a beautiful 1901 map or plan of Washington D.C. by J. G. Langdon. Prepared under the direction of the sub-committee on the improvement of the park system, the map covers Washington D.C. from Alexandria and the Arlington Cemetery eastward as far as Capitol Heights and from the American University Park and Rock Creek Park south to Bellevue. It notes current park areas, important buildings, individual streets, railroads, bridges, canals, rivers, schools and topography throughout. A legend in the bottom left quadrant indicates areas controlled by various institutes and government departments and agencies including the War Department, Interior Department, Navy Department and the Smithsonian. This map, predating the important McMillan Plan by a year, notes the members of the Sub-Committee on the Improvement of the Park System, including its chairman James McMillan, and the members of the Commission on the Improvement of the Park System including Frederick Law Olmstead, under whose direction this map was prepared. This map was prepared by J. G. Langdon and published by A. Hoen and Company.